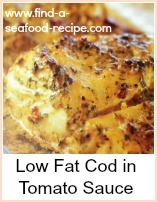 When I look at fish recipes, low cholesterol keeps coming up in the 'blurb' about fish. I forget that fish is a good all rounder in the nutrition stakes - maybe it's my memory? Eat more fish eh? 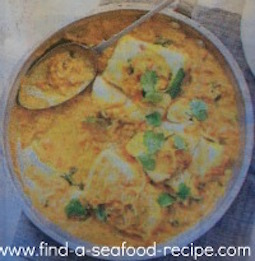 So - here's a great fish curry - serve it with plain boiled rice or a nan bread. I always use plain yoghurt in my curries - it softens the harshness of the spices. Also, a small can of tomatoes, chopped very finely most times. This adds some acidity to the curry as well as making a good amount of sauce. 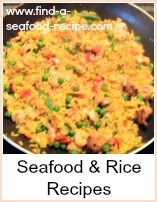 Fish cooks really quickly and so this is a meal you can make in a few minutes. Heat the oil and gently fry the onion, garlic and chilli until soft. Stir in the spices and cook for 2 minutes. Add the tomato puree, coconut and stock, stir thoroughly at this point to blend the oil, spices and liquid - bring to the boil. Add the and fish and reduce to simmer for about 10 minutes. The fish should have cooked through by this point. You can tell when it's done by pressing it with your finger. If it's firm to the touch, then it's cooked. Do be careful - the sauce will be hot and you can easily burn yourself when you do this. Best practice is to lift a piece out on a slotted spoon and then press it. 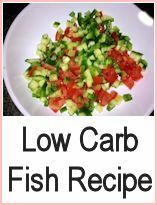 This easy and tasty fish curry recipe is a great low cholesterol option.